Shopping for a new Kia Sorento? The 2019 Kia Sorento SX and SXL have special steering tuning that gives them remarkably good handling. Think of the 2019 Kia Sorento as the shortstop of crossover SUVs. This three-row crossover does just about everything well, and some things even better for 2019 thanks to some tweaks to its suspension and steering. It’s roomy, comes standard with three rows of seats, offers a sophisticated V-6 engine teamed to a new 8-speed automatic, and well-priced. This year, the Sorento’s styling has been updated—but so subtly that it hardly renders the outgoing version yesterday’s news. The smooth, well-detailed design looks especially good in higher trim levels with their bold LED fog lights up front and alloy wheels that grow from 17 inches in base models up to 18- and 19-inchers on EX and higher trim levels. Inside, the cabin is well-organized and composed of soft-touch materials with a low sheen. Even at around $27,000, the base Sorento L doesn’t look or feel cheap inside. There’s decent room, but the Sorento’s 7-passenger capacity implies that not all the children are above average. The second row is low and not shaped for long-distance comfort. The newly standard third? row is not better, but our expectations are lower; there’s good room for two teenagers back there. The Sorento is smaller than some of its rivals, like the Toyota Highlander, so there’s less room for cargo aboard. What’s there is usable, though, and with up to about 73 cubic feet of overall cargo capacity, the Sorento should fulfill most needs. Underhood, L and LX trims come with a lowly 4-cylinder engine and a choice of front- or all-wheel drive. 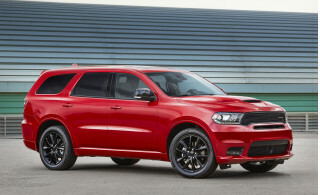 EX and higher trims are fitted with a more desirable 290-horsepower 3.3-liter V-6 that shuttles power to either the front or all four wheels via an 8-speed automatic transmission that has two more gears than last year’s. The engine is smooth and powerful, but no replacement for the strong turbo-4 that was optional, albeit not very popular with buyers, last year. What the Sorento begs for is a hybrid powertrain since its fuel economy figures don’t impress as much as its driving manners. The newly tuned steering is crisp and precise, almost enough for drivers to forget that they’re hustling a three-row crossover on a twisty road. The firm suspension doesn’t feel stiff. It feels more like an Audi Q7 than an affordable crossover. The latest Sorento hasn’t been crash-tested, but we see little reason that last year’s impressive figures won’t carry over. Kia hasn’t followed Toyota and Honda, among others, in making collision-avoidance tech like automatic emergency braking standard across the line. You’ll find that gear on EX and higher trim levels only. Otherwise, the feature count is good. A big infotainment screen that’s Apple and Android compatible leads the way. Pop for the Sorento SXL and the roughly $45,000 sticker price might induce some shock, but the soft, heated and cooled nappa leather and 10-speaker Harman Kardon audio system seem worth the price. The 2019 Kia Sorento gains new front and rear bumpers this year that hardly change its personality. This crossover’s grille is SUV-big without Escalade ostentation. Swept-back headlights flank the chrome-heavy grille. They’re projector-beams in most models, but Kia does offer LED headlights on high-spec variants. Below on most trim levels sits a four-light LED foglight housing that adds more visual interest. From the side, the Sorento is ordinary, although new wheel designs for 2019 brighten things up. Viewed from the rear, the Sorento’s high-mounted taillights push no boundaries but are well-integrated into the tailgate. Inside, the Sorento’s cabin is dressed in nice materials and is pleasingly well-organized. It tries little new, which is just fine with us. A 7.0-inch touchscreen sits high on the dash, with climate controls arranged below. Toggle-style switches for the available heated and cooled seats look good on higher-spec variants, but serve as a reminder that you could have paid more for more on L and LX trims. New this year are two earth-tone interior options on SX and SXLs, while all models get a redesigned steering wheel that could have come from an Audi. 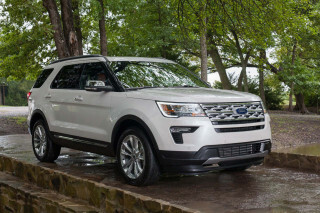 The base 2.4-liter inline-4 puts out a modest 185 horsepower and 178 pound-feet of torque, and it’s only offered only on L and LX trims with a 6-speed automatic. 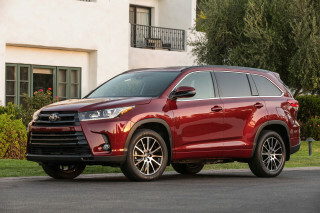 Skip it and consider the LX V6 trim level as the gateway to the lineup. At 290 hp and 252 lb-ft, the V-6 engine offers considerably more grunt and pairs well to a new 8-speed automatic with two more cogs than last year’s model. The turbo-4 that put some spice into last year’s Sorento is gone due to lack of demand. The V-6 accelerates with little drama and rarely makes its presence known inside the Sorento’s cabin. Its 8-speed dance partner leads it along nicely, although we noticed some grumbling low-speed shifts in the pre-production models we tested. That our initial evaluation was at 9,000 feet above sea level may have something to do with that, too. All-wheel drive is on the options list for all but the base Sorento L and it provides good foul-weather grip and a convenient “lock” mode for deeper snow. With 7.3 inches of ground clearance, the Sorento rides high enough to conquer a Nor’easter, but it’s not an off-roader. Headlining the updates for 2019 is what you can’t see: subtle changes to the suspension and especially the steering that improve handling. L, LX, and EX versions have steering that’s light and precise. The SX and SXL have their own tuning that’s just sublime, at least by three-row crossover standards. All have an exceptionally well-damped ride that adds confidence even over rutted pavement. With all-wheel drive and the V-6 option, the Sorento can tug up to 5,000 pounds worth of trailer. 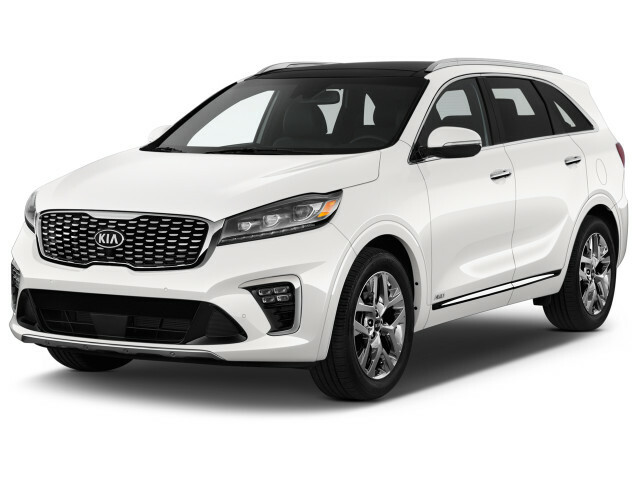 The 2019 Kia Sorento has a classy feel inside and excellent front seats that belie its reasonable price tag. Unfortunately, the second row sits low to the floor and the third row comes up short against direct rivals that are larger outside. It’s worth pulling rank to sit up front in the Sorento. All versions of well-sculpted front seats with terrific support, while higher-trim versions even include a power-extendable thigh support for the driver. The fabric that’s standard on L and LX trims is fine, while the EX includes leather at a price that undercuts rivals. SXLs trade those hides for softer nappa leather. Row two doesn’t score the same points. It’s wide enough for three, but the cushion is low to the floor and short on shaping. Adding insult to injury, the panoramic moonroof that can be fitted to EX and higher trims robs head room. The second row tilts forward for access to the third row, which is now standard on all Sorentos. There’s decent space for two back there, especially if they’re kids. Unlike a few rivals, though, the Sorento’s tight dimensions mean that a child seat can’t be left attached to the second row when it’s scooted forward for access to row three. Overall cargo capacity is 73.0 cubic feet, which is on the low end for the Sorento’s segment. Particularly disappointing is the mere 11.3 cubes available behind the third row. However, the Sorento’s 189.0-inch overall length is more than half a foot shorter than some rivals, which means it’ll fit in more garages and parking spots. That’s a tradeoff worthwhile to many buyers. Perhaps the most impressive aspect of the Sorento is its sense of solidity. On most trims, Kia makes good use of acoustic glass and sound deadening. The materials the automaker chooses have a pleasant low sheen and most surfaces have a soft, upmarket feel not seen in most rivals. The 2019 Kia Sorento is available with a full roster of safety gear, but we’re disappointed that not everything is standard equipment as on some rivals. All Sorentos have six airbags, stability control, and a rearview camera. Base L trims stop there, which helps explain a price tag of about $26,000. The LX trim adds blind-spot monitors and rear cross-traffic alerts. Parking sensors are on the options list. Step up to the Sorento EX and Kia starts to pile on features that are standard on all Honda Pilots, Toyota Highlanders, and Nissan Pathfinders: forward-collision warnings with automatic emergency braking, adaptive cruise control, and active lane control. Optional on the SX and standard on the SXL are automatic high-beam headlights and a surround-view camera system. The Sorento L’s base price, around $26,000, makes it look appealing on paper, but it’s light on features—plus it’s only available with the underwhelming 4-cylinder engine and front-wheel drive. Three rows of seats and a 7.0-inch infotainment system with Apple CarPlay and Android Auto compatibility are standard equipment, but the Sorento L comes up short on luxuries otherwise. Step up to the Sorento LX and satellite radio, blind-spot monitors, rear cross-traffic alerts, two quick-charge USB ports, and an acoustic windshield are standard. The LX offers the V-6 engine as an option, where it is paired with a power passenger seat and automatic climate control. Next up, the Sorento EX strikes a high value proposition with more acoustic glass, a 7.0-inch TFT screen in the instrument cluster, leather upholstery, heated front seats, a power tailgate, rear-seat climate control, and a slew of safety gear like automatic emergency braking and adaptive cruise control. A single option package pairs an 8.0-inch infotainment screen with Harman Kardon speakers and a panoramic moonroof on the EX. The Sorento SX loads on larger wheels, unique exterior styling, a power passenger seat, Harman Kardon audio, and unique steering tuning. Topping the lineup at about $45,000, the Sorento SXL isn’t cheap—but it is well-equipped. Nappa leather seats that are cooled up front and heated in the first and second rows, a heated steering wheel, and LED headlights give it luxury car chops at a far lower price tag. All Sorentos include a 10-year, 100,000-mile powertrain warranty and a 5-year, 60,000-mile bumper-to-bumper warranty that’s a year or two beyond most direct rivals. 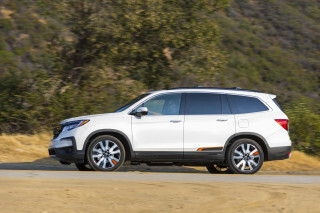 That figure is based on the Sorento with the optional V-6 and all-wheel drive, which is rated by the EPA at 19 mpg city, 24 highway, 21 combined. With front-wheel drive, those figures climb to 19/26/22 mpg. The base 4-cylinder is thriftier, but not by as much as some buyers might hope. 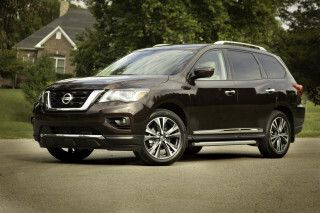 With front-wheel drive, it’s rated at 22/29/25 mpg, while all-wheel drive dents that to 21/26/23 mpg. All that said, Kia plans to offer a turbodiesel version of the Sorento—but it’s not clear if that is for this year or if it will come later. Kia Sorento is an excellent vehicle for the money. Chosen for its safety and reliability, it also has many features only available in luxury vehicles costing tens of thousands more. Dual exhaust would be nice - it would give it a more sporty look. All their competitors with a v-6 have it. Looking for a different year of the Kia Sorento?